Created in 1864, Smirnoff No. 21 Premium Vodka is now the number one best-selling premium vodka brand in the world and is sold in over 130 countries. It is triple distilled from a blend of different grains and filtered ten times through seven columns of environmentally sustainable charcoal for an exceptionally pure-tasting, smooth spirit. Smirnoff No. 21 Premium Vodka can be used in a wide range of drinks and cocktails: served straight up or on the rocks over ice; with ginger ale and fresh lime for a classic Moscow Mule; or with orange liqueur, cranberry juice and a squeeze of fresh lime for a sophisticated Cosmopolitan. 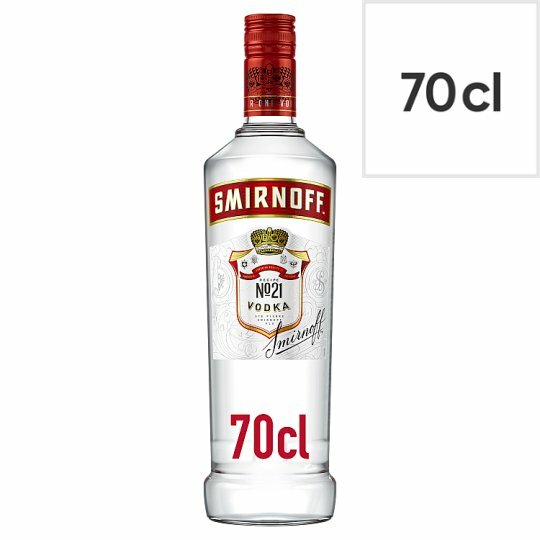 Or why not spice things up by mixing Smirnoff No. 21 Premium Vodka with tomato juice, Worcestershire sauce and Tabasco to make a fiery Bloody Mary? This versatile vodka is ideal to make delicious drinks at home. Continuing the traditions of P.A. Smirnoff, chosen as a purveyor to the Imperial Russian Court in 1886.